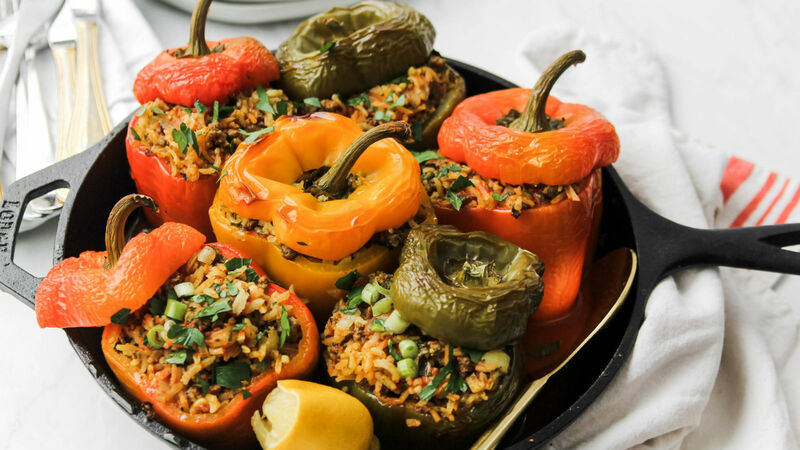 I love finding the commonalities among different global cuisines, and it seems that every culture has their own version of stuffed vegetables. Each tradition has variations of spices and stuffings, but the idea is always the same: They are the kind of cozy, home-cooked recipes that remind me of the grandmas and aunts who have big tables, open doors, and warm hearts. Although I am not Persian, I’ve always felt connected to Persian food and find comfort and familiarity in the spice blends that are so closely related to my own Yemenite roots. Rinse basmati rice well until water runs clear. In a small saucepan, combine the rice, 1 1/4 cups of water, and 3/4 tsp kosher salt. Cook per package directions, fluff with a fork, and set aside. In a large skillet, heat the olive oil over medium heat. Add the onions and ground beef and a teaspoon of kosher salt. Using a flat wooden spatula to break up the ground beef, cook for about 10 minutes, until the meat is cooked through and just starting to brown, but some juices are still left in the pan. Add the tomato paste, mix well to incorporate, and set aside off the heat. Combine all of the ground spices in a small bowl, whisk, set aside. Preheat the oven to 350 degrees F. In a large bowl, combine the cooked rice, chopped cilantro, parsley, mint, and scallions. Add the beef and onions mixture, and the spice blend. Using a large spoon, combine all filling ingredients thoroughly. Carefully cut off the tops of the peppers, trying to keep the stem intact. Using a spoon or small pairing knife, scoop out the membranes and the seeds. If the peppers are wobbly, you can carefully slice off a tiny bit of the bottom to level it, careful not to cut a hole in the skin. Arrange the peppers tightly together in a baking dish or cast iron skillet. Generously spoon the filling mixture in each pepper all the way to the top, packing it down slightly. Top each pepper with its stem top. In a small sauce pan, combine the 2 cups water, saffron, 2 tablespoons tomato paste, lemon juice, and 1/2 tsp salt. Whisk to dissolve the tomato paste, then pour the sauce mixture between the peppers to fill the bottom of the baking dish. Bake for 50-60 minutes until the peppers are fragrant and slightly wilted. Spoon some pan sauce into each pepper, and serve with slices of fresh lemon and a big green salad if desired.